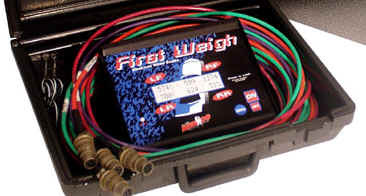 Designed for the budget racer who's unwilling to settle for less than an accurate, reliable scale system. Electronic Wheel scales feature full-time, four-wheel display and NEW smaller 12" x 12" wheel pads ~ in a system most anyone can afford. Easy-to-read 2 line display shows any combination of weights and percentages--on "Full Time Display!" FirstWeigh™ Scales use the very latest in microchip technology, giving you the highest level of accuracy and repeatability. 12" x 12" scale pads with 1100 lb. capacity work great for all but the heaviest cars.